Pure Storage set to paint VMworld 2014 orange! VMworld is one of the premier infrastructure technology conferences you can attend. Attendees rave at the insight of the keynotes, the innovation on display by VMware and their partners, the technical depth of the sessions, the ability to get hands on with the technology and of course… the party. Planing for the 2014 event is shaping up to look like another stellar conference with Pure Storage seeking to paint the show orange! We’re involved in 8 sessions (and hopefully some will repeat). We’re running the gamut from discussing new tech like VVOLs, to deep diving on all-flash, including an old favorite, ‘The Chad & Vaughn Show’ and introducing an over the top, star studded, interactive gameshow! Think you know storage? 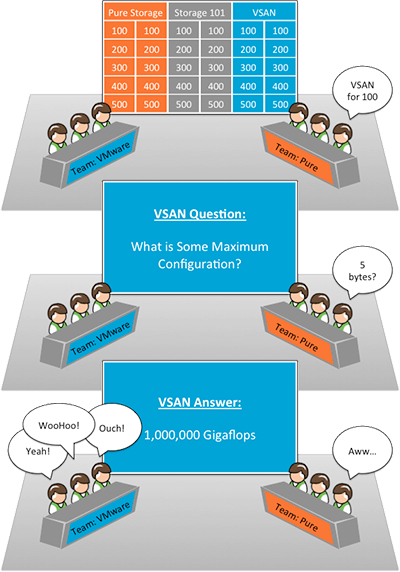 The vExpert Storage Game Show will pit 2 teams of vExperts in a jeopardy style game discussion the latest in storage technologies with vSphere and adds a level of audience participation never experienced at VMworld! Duncan Epping, Cormac Hogan and Rawlinson Rivera represent team VMware who will go head-to-head with team Pure Storage comprised of Vaughn Stewart, Cody Hosterman and Craig Chapman to see who knows more about FlashArray, VSAN, and vSphere Storage Configurations. Each team will be joined by a player drawn randomly from the audience – this could be you, so don’t arrive late! This session is over the top – some of the questions will be for the audience, which could earn some the adoration of their peers, the respect of the vExperts and a fantastic prize! The categories for the game show are: FlashArray, VSAN, and vSphere Configurations. Questions will span architectural considerations, configuration limits, supported designs, best practices, interoperability and more. Join us for what is sure to be the most talked about session of VMworld. The winners will be adorned in accolades and awarded trophies. Join vExperts Vaughn Stewart and Cody Hosterman for a technical discussion on flash storage best practices for vSphere and Horizon. This session will also include presentations, video demos and technology previews of Pure Storage and VMware technologies including the impact of virtual disk formats on performance, migrations and clones, data reduction technologies from virtual disks to datastores to flash, performance optimization, multipathing and network considerations for fibre channel and iSCSI, SIOC settings, SRM and data protection, VCAC/VCO automation, and the upcoming VVOLs. Flash is fast – but there’s much more to gain beyond performance. This session will help you maximize your cloud’s capabilities while reducing data center resources and radically simplifying your vSphere environment. Flash is quickly becoming the new storage foundation powering private and public clouds around the globe – this session will prep you to understand why. Storage can limit what is possible with one’s virtual infrastructure, cloud or end user computing environment. Joel McKelvy hosts VMware admins and Cloud architects from LinkedIn, SkullCandy and the University of California, Berkeley to discuss their experiences moving from a disk based infrastructure to VMware on all flash storage. The panel will share the technical details around their business goals, virtualized applications, automation and workflows, monitoring, VMware and storage settings and IT processes and operations. Topics being discussed will compare and contrast the technical setting and gains in these areas. This session isn’t a typical storage session, it’s a conversation with virtualization technical experts. Guys who think cloud and application first – and used to grind their teeth over storage. This is an ideal session for those who want to understand the real-world experiences of other VMware teams. Virtual Volumes (VVols) is VMware’s new storage paradigm for external SAN/NAS storage arrays. In this session, we will walk you through key technical concepts of Virtual Volumes, in depth. We will also compare in detail some of the existing features in VMFS/NFS with VVols. In addition, You will also get an overview of some of our partner solutions and their approach with VVols. The promise of Software Defined Datacenter (SDDC) includes the use of virtualized infrastructure for all applications and most importantly the business critical applications. Performance, scalability and availability are prominent concerns when customers are considering comprehensive Cloud architectures. Traditional infrastructure is often the main bottleneck for virtualizing mission critical applications like Oracle DB, SAP, SQL Server and Java applications. 90% of the problems in virtualizing these applications are storage related. Legacy SAN infrastructure is complicated to setup, manage and maintain. The inflexibility of legacy storage quite often reduces ROI and increases inefficiency and time to deployment. It cannot support the level of performance required by these applications to meet the needs of your business. The advent of all flash storage is changing the landscape, removing the complexity associated with legacy storage, while delivering supercharged performance that allows you to virtualize mission critical applications with confidence. This session will explore architectural considerations and best practices that will allow you to virtualize your business critical application on vSphere using an all flash array and specifically a Pure Storage array. This session will present a panel of enterprise customers who will talk about their log management implementations with vCenter Log Insight. Topics will be covered will be enterprise topology, configuration, log collection performance, most valuable queries, dashboard construction, and comparison to other log management solutions. The panel will include 3-4 Log Insight enterprise customers who will be interviewed by a moderator. As the storage industry is constantly evolving, Howard Marks, the legendary grey beard of storage, will moderate this panel to highlight the changes and innovations in the market. He will manage the discussion with storage experts that are driving the industry forward through new architectures and advanced technologies. The experts will discuss how the industry is changing the way organizations use and interact with storage, specifically highlighting new service oriented architectures, improved storage implementation and management technologies, and more. In addition to the moderator and panelists, audience members will be active members of this session and are encouraged to send their burning questions for the panelists to Marks via Twitter. Therefore, attendees will hear their questions answered live during the panel, and the session will be interactive, entertaining and informative. STO2496-SPO – vSphere Storage Best Practices: Next-Gen Storage TechnologiesThe ‘Chad and Vaughn Show’ presents technical best practices with emerging storage technologies for vSphere. The storage industry is experiencing a high level of innovation that will influence your next datacenter refresh. Storage industry experts present this session in a vendor neutral perspective on best practices with storage infrastructure technologies spanning host-based acceleration, all-flash, and hyper-converged. Vaughn and Chad focused on delivering a deep technical session and have invited Rawlinson Rivera of VMware to join and expand the knowledge transfer. This session will present best practices that span connectivity, performance, availability and failure domains, data protection and automation. Remember, July 14th you can register for these and all of the VMworld 2014 sessions!